Installed in late May 2016, Outer Seed Shadow (OSS)#02 serves as a green space to discuss issues of coexistence, immigration, and cultural identity. 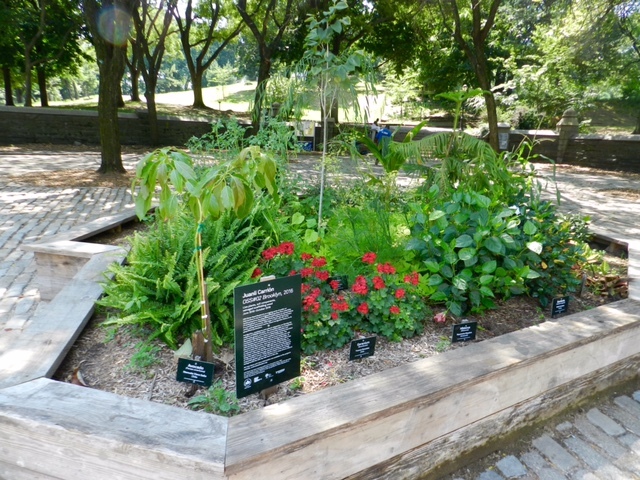 It is the second in a series of five gardens to be installed in each of the boroughs of New York City. This project was conceived in 2014 after Brooklyn-based artist, Juanli Carrión, who was born in Yecla, Spain started to consider permanent residence in the United States and came across the term “outer seed shadow”. In plant migration, outer seed shadow is the region where there is an influx of seeds from a species’ reproductive core, but where—due to adverse conditions—seed germination and seedling reproduction are complicated, causing a decrease of those species’ representatives in this region. He started to think more about how this concept related to the new realities of New York immigration life, coexistence, and the idea of American “melting pot”. Subsequently, he decided to create a living sculpture garden to talk about these concepts. Carrión conducted a series of interviews with immigrants, who are currently residing in Brooklyn, to discuss personal experiences of arrival, cultural identity, and assimilation to the United States. Each interviewee selected a plant that exists both in their country of origin and in the United States. They were then planted in a 230-square-foot garden bed that was shaped like Brooklyn and made with salvaged scaffolding wood. The plants were placed according to the locations of the interviewee’s current homes. 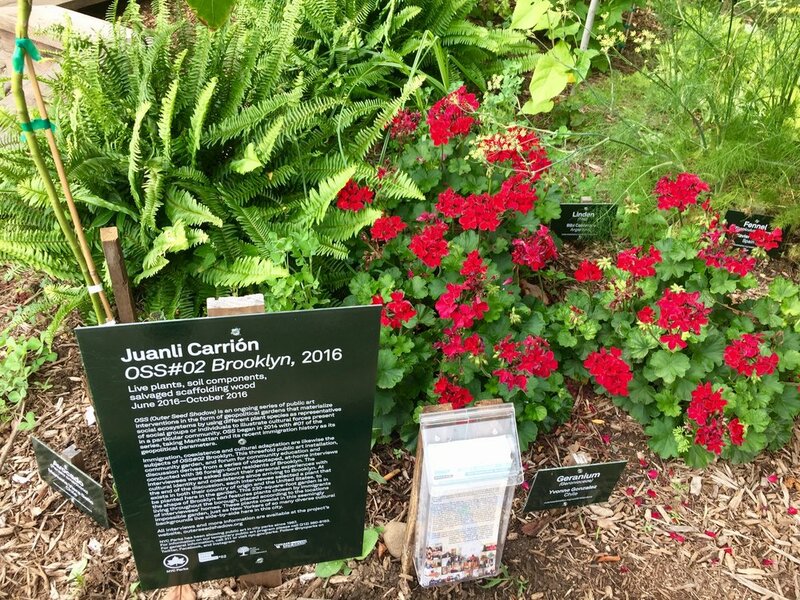 Since the installation, Juanli has started to hold “Open Garden” weekly workshops. Residents, student groups and other New Yorkers take part in these workshops. The attendees learn about the project, garden to ensure the plants’ survival, and learn about the origin of plants and the specific care each plant requires. Afterwards, they discuss the day’s experience and how it reflects on the diversity of immigrant experience, social interaction, and cultural values. The workshop held in Fort Greene Park on August 20 was hosted by the artist and gardener, Hannah, from the Brooklyn Botanical Garden's Brooklyn Urban Gardener Program. with Fort Greene Park’s volunteer gardeners. Since OSS#02 contains plants from all over the world, each plant in the garden needed very specific care. The type of soil, the amount of sun, and watering needed to be taken into account. The plants relied on the community to not only survive, but to flourish in the same environment. There were cacti growing next to corn, and parsley growing next to coconut palm trees. Some of the plants, such as the four o’clock flowers, were having a hard time adapting to the environment, while others, like the sweet potato plants, were adapting well they started to take over the garden bed. The attendees, with the assistance of Hannah and Juanli, helped remove the harmful weeds that appeared, prune the sweet potato plants with hedge shears, plant cacti and 4 o’clocks in the bed, and give sturdy support to the wilting avocado trees, white potatoes, and corn plants. Plants from all over the world! Garden bed finally not overgrown by sweet potato plant! This was a botanical and horticultural challenge that essentially represented the reality of immigrants who selected these plants. After gardening, there was a great conversation with all of the participants. People spoke of their experiences trying to coexist with other members of the community. They shared their perspectives of the garden, and issues of cultural identity. A recurring topic that everyone seemed to enjoy talking about was the idea that the different plant species were representatives of the interviewees and the cultural forces present in the Brooklyn communities. These plants coexist in this nearly impossible garden, just as New Yorkers of so many diverse cultural backgrounds live side-by-side here in this city. Like the plants in the garden, the different groups of people are unique with their own degree of adaption. Community engagement is essential for them to co-exist and flourish. The exhibition closes on October 22, 2016 with a plant adoption event. If you would like to adopt one or more of the plants from the garden please email project@outerseedshadow.org. In addition, the videos of the interviews are posted on www.OuterSeedShadow.org/oss02/. This Brooklyn public art centerpiece was developed in conjunction with NYC Parks Department and is funded by the Fort Greene Park Conservancy, Myrtle Avenue Brooklyn Partnership, and Brooklyn Arts Council. Public workshops are funded with support from the Partnerships for Parks Capacity Fund Grant, presented by TD Bank, made possible by the City Parks Foundation and the Parks Equity Initiative of the New York City Council under the leadership of speaker Melissa Mark-Viverito.